Lewis explains why 2019 weight regulations are great news for F1's drivers: "I do feel in a healthier state than I've been for 12 years"
Lewis Hamilton has revealed how 2019 rule changes and a revised winter fitness regime have put him in the "best shape" of his Formula 1 career. The introduction of a minimum driver weight - 80kg once seat and race overalls are also taken into account - as part of revised car weight rules has given drivers more leeway to bulk up. "I feel stronger and fitter than I've ever been, all round," declared Hamilton. Mercedes boss Toto Wolff made the same observation about his five-time champion driver - with Hamilton pleased the regulations have finally changed. "I can lift more weights, probably. It's a good thing," said Hamilton. "In the past 12 years each of us drivers have had to be a certain weight and it's not particularly great. You are missing meals and all these different things to make sure you hit the right weight limit, so not always having the maximum energy. But it's great with the rule change, it's better for the drivers. "You can be in a healthier state and I do feel in a healthier state than I've been for 12 years. You can eat more, you can maybe sleep better and have more energy. So I'm definitely happier." So how did Hamilton prepare for 2019? The world champion explained how a varied programme allowed him to work on "different disciplines" of fitness during his break from F1. "For once to have that bar lifted and dig deep into other elements of training has been quite an exciting challenge," explained the 34-year-old. "Every year when you get back into training it's painful but I have been trying different methods and worked with several different people for once. "I don't have a trainer, but people I know of, or I've got in touch with, I've gone and worked with them for a week to try different things throughout the weeks which have been exciting." 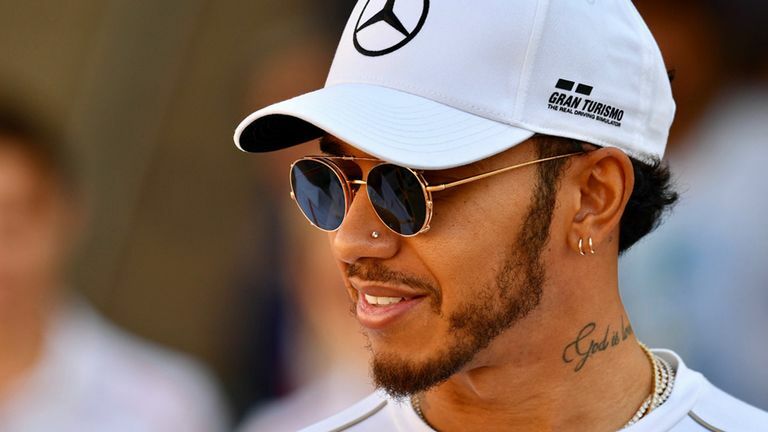 Hamilton said his programme included work with a specialist vegan trainer - the Englishman switched to a plant-based diet in 2017. What's the F1 pecking order? "You target more defined, more efficient muscle," Hamilton added. "I'm not trying to be the Hulk, but it takes a long time to put muscle on in the right way as well. "It's been great to eat as much as I want with bigger portions."